I like good tools. 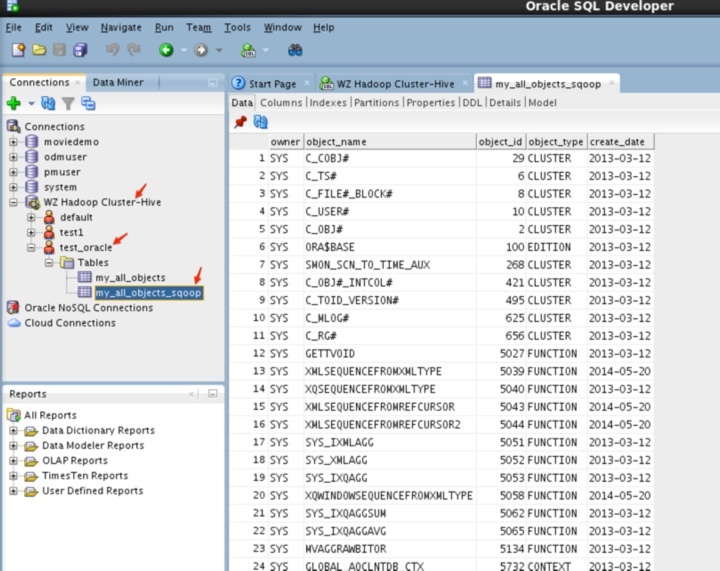 CELLCLI is a useful tools to perform administration works on Exadata Storage Servers. 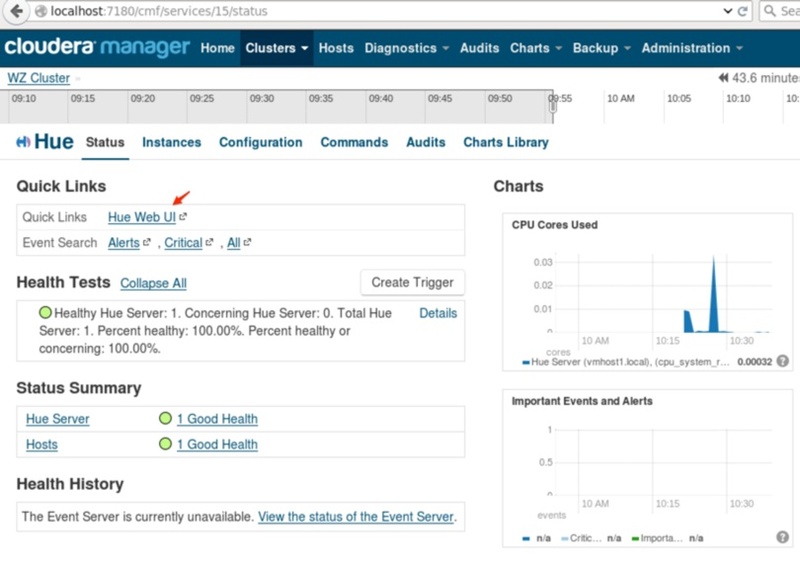 Now, starting Exadata Storage Server Release 12.1.2.1.0, there is another utility, called DBMCLI to configure and monitor Exadata Database Servers. DBMCLI replaces the /opt/oracle.cellos/compmon/exadata_mon_hw_asr.pl Perl script. 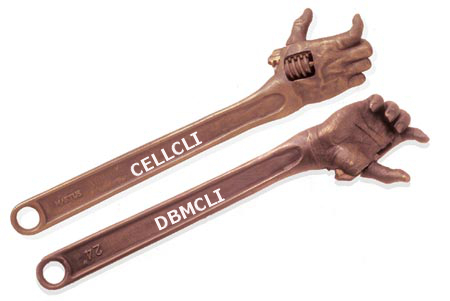 The usage of DBMCLI is similar to the usage of CELLCLI. With DBMCLI, we can start/stop services, list alert history, configure SMTP, and monitor hardware components. Here are a few examples executing on our X3 box in the lab. I removed some similar content from the execution result to save space here. lunWriteCacheMode: 	 "WriteBack, ReadAheadNone, Direct, No Write Cache if Bad BBU"
Here are the result from list alerthistory. 5_1	 2015-06-16T12:39:32-05:00	 critical	 "A power supply component is suspected of causing a fault with a 100 certainty. Component Name : /SYS/PS1  Fault class    : fault.chassis.power.ext-fail  Fault message  : http://www.sun.com/msg/SPX86-8003-73"
5_2	 2015-07-15T15:59:20-05:00	 clear   	 "A power supply component fault has been cleared. Component Name       : /SYS/PS1  Trap Additional Info : fault.chassis.power.ext-fail"
6_1	 2015-06-25T19:36:44-05:00	 critical	 "File system "/" is 80% full, which is above the 80% threshold. Accelerated space reclamation has started. This alert will be cleared when file system "/" becomes less than 75% full. Top three directories ordered by total space usage are as follows: /opt        : 7.79G /home        : 7.38G /usr        : 3.06G"
7_1	 2015-07-06T14:33:51-05:00	 info    	 "The HDD disk controller battery is performing an unscheduled learn cycle. All disk drives have been placed in WriteThrough caching mode. The flash drives are not affected. Battery Serial Number : 10494  Battery Type          : ibbu08  Battery Temperature   : 39 C  Full Charge Capacity  : 1368 mAh  Relative Charge       : 98%  Ambient Temperature   : 19 C"
7_2	 2015-07-06T15:45:31-05:00	 clear   	 "All disk drives are in WriteBack caching mode. Battery Serial Number : 10494  Battery Type          : ibbu08  Battery Temperature   : 39 C  Full Charge Capacity  : 1368 mAh  Relative Charge       : 72%  Ambient Temperature   : 17 C"
8_1	 2015-07-15T15:59:35-05:00	 critical	 "A power supply component is suspected of causing a fault with a 100 certainty. Component Name : /SYS/PS1  Fault class    : fault.chassis.power.ext-fail  Fault message  : http://www.sun.com/msg/SPX86-8003-73"
8_2	 2015-07-15T16:01:37-05:00	 clear   	 "A power supply component fault has been cleared. Component Name       : /SYS/PS1  Trap Additional Info : fault.chassis.power.ext-fail"
9_1	 2015-08-04T22:04:16-05:00	 critical	 "File system "/u01" is 80% full, which is above the 80% threshold. This alert will be cleared when file system "/u01" becomes less than 75% full. Top three directories ordered by total space usage are as follows: /u01/app        : 147.43G /u01/lost+found        : 16K /u01/stage        : 4K"
If want to check out the detail of alert history, run the following. alertDescription:  	 "A power supply component suspected of causing a fault"
alertMessage:      	 "A power supply component is suspected of causing a fault with a 100 certainty. Component Name : /SYS/PS1  Fault class    : fault.chassis.power.ext-fail  Fault message  : http://www.sun.com/msg/SPX86-8003-73"
alertAction:       	 "For additional information, please refer to http://www.sun.com/msg/SPX86-8003-73"
alertDescription:  	 "A power supply component fault cleared"
alertMessage:      	 "A power supply component fault has been cleared. Component Name       : /SYS/PS1  Trap Additional Info : fault.chassis.power.ext-fail"
alertDescription:  	 "File system "/" is 80% full"
alertMessage:      	 "File system "/" is 80% full, which is above the 80% threshold. Accelerated space reclamation has started. This alert will be cleared when file system "/" becomes less than 75% full. Top three directories ordered by total space usage are as follows: /opt        : 7.79G /home        : 7.38G /usr        : 3.06G"
alertAction:       	 "MS includes a file deletion policy that is triggered when file system utilitization is high. Deletion of files is triggered when file utilization reaches 80%. For the / file system, 1) files in metric history directory will be deleted using a policy based on the file modification time stamp. Files older than the number of days set by the metricHistoryDays attribute value will be deleted first, then successive deletions will occur for earlier files, down to files with modification time stamps older than or equal to 10 minutes, or until file system utilization is less than 75%. 2) files in the ADR base directory and LOG_HOME directory will be deleted using a policy based on the file modification time stamp. Files older than the number of days set by the diagHistoryDays attribute value will be deleted first, then successive deletions will occur for earlier files, down to files with modification time stamps older than or equal to 10 minutes, or until file system utilization is less than 75%. The renamed alert.log files and ms-odl generation files that are over 5 MB, and older than the successively-shorter age intervals are also deleted. Crash files that are over 5 MB and older than one day will be deleted.Try to delete more recent files, or files not being automatically purged, to free up space if needed." If just want to check out the critcial alerts, run the following. We can also find out the meric history information. If just want to know the average number of processes in the run queue, run the following. DS_MEMUT: The percentage of total physical memory used on the server. DS_SWAP_IN_BY_SEC: The number of swap pages read in KB per second. DS_SWAP_OUT_BY_SEC: The number of swap pages written in KB per second. DS_SWAP_USAGE: The percentage of swap space used. N_HCA_MB_RCV_SEC: The number of MB received by the InfiniBand interfaces per second. N_HCA_MB_TRANS_SEC: The number of MB transmitted by the InfiniBand interfaces per second. N_NIC_KB_RCV_SEC: The number of KB received by the Ethernet interfaces per second. N_NIC_KB_TRANS_SEC: The number of KB transmitted by the Ethernet interfaces per second. 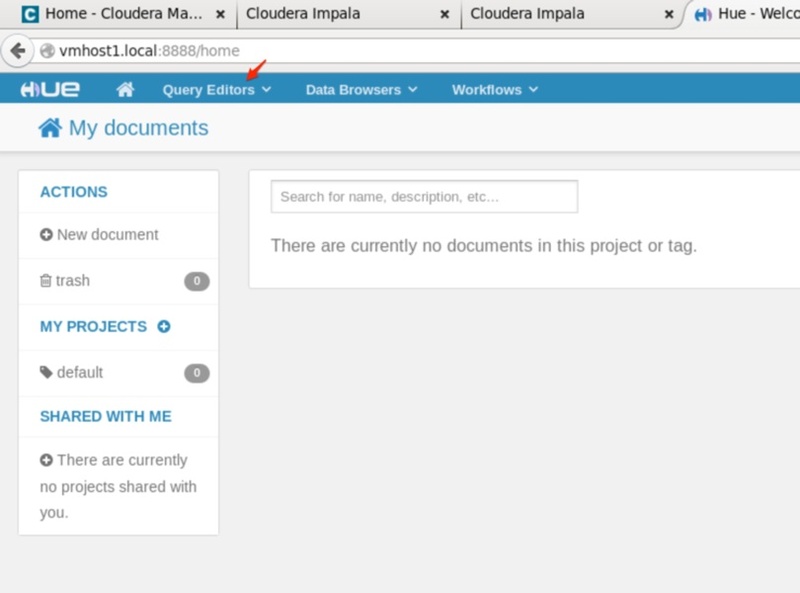 Another useful feature is that DBMCLI can configure email notifications for database server. I did not perform the following steps, just use the example from Oracle document. 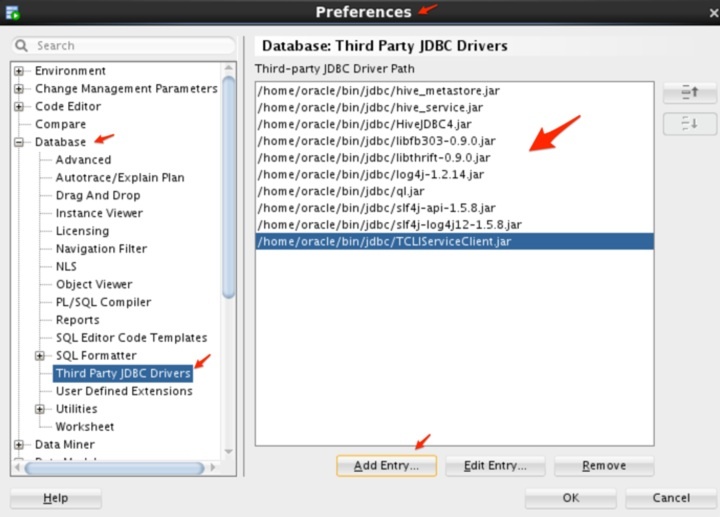 To get further detail about DBMCLI, check out the document at http://docs.oracle.com/cd/E50790_01/doc/doc.121/e51951/app_dbmcli.htm#DBMMN22053. 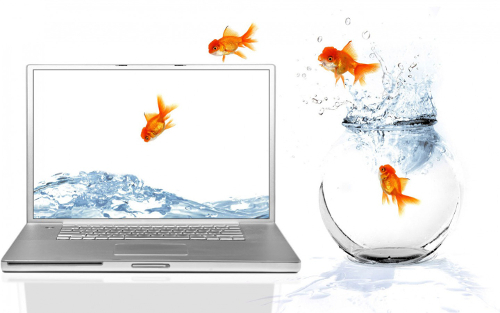 This post will discuss a different operation, exporting data from Hive table to Oracle database, just like goldfish jumps from fish bowl to the laptop. Again, we still use Sqoop to perform this operation. 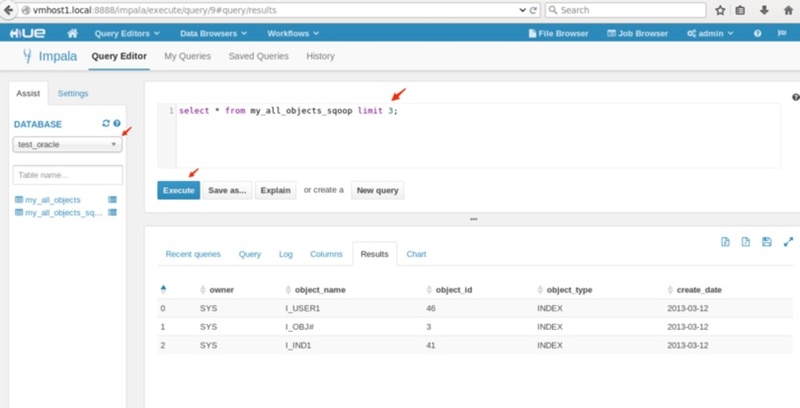 The following example will export the data from my_all_objects_sqoop table in Hive to WZHOU.TEST_IMPORT_FROM_SCOOP table in DBM database on X3. 1. 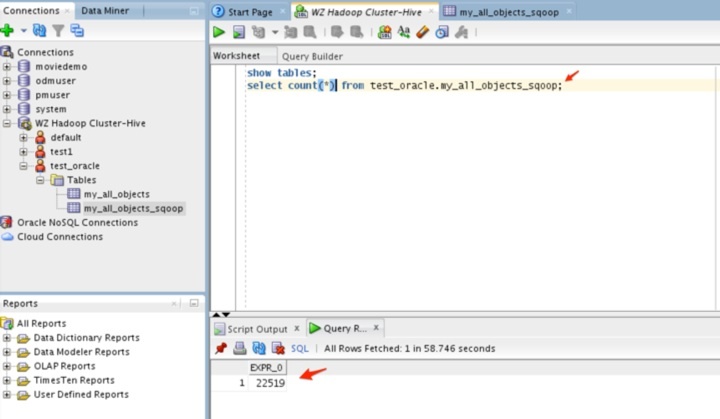 Create WZHOU.TEST_IMPORT_FROM_SCOOP table in Oracle. 2. Run the sqoop export job. 15/09/22 07:02:46 WARN tool.BaseSqoopTool: Setting your password on the command-line is insecure. Consider using -P instead. 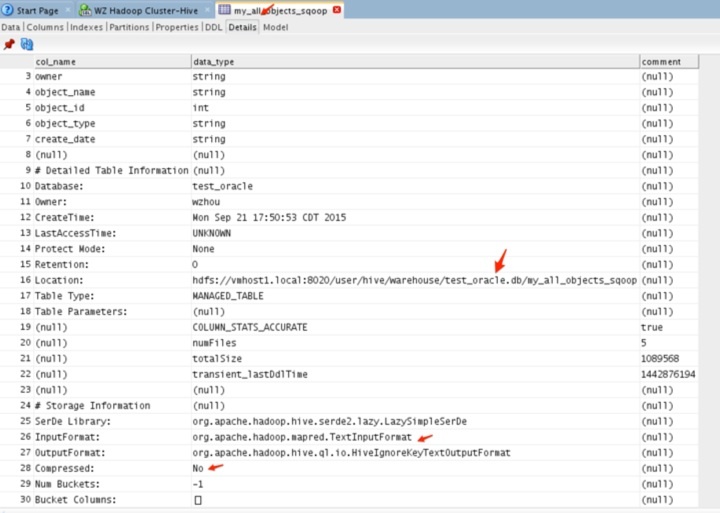 15/09/22 07:02:48 INFO oracle.OraOopManagerFactory: This Oracle database is a RAC. Note: /tmp/sqoop-wzhou/compile/f33da649a2f40c4d01ab1701ed0d21a5/WZHOU_TEST_IMPORT_FROM_SCOOP.java uses or overrides a deprecated API. 15/09/22 07:04:55 INFO mapreduce.ExportJobBase: Exported 22519 records. 3. 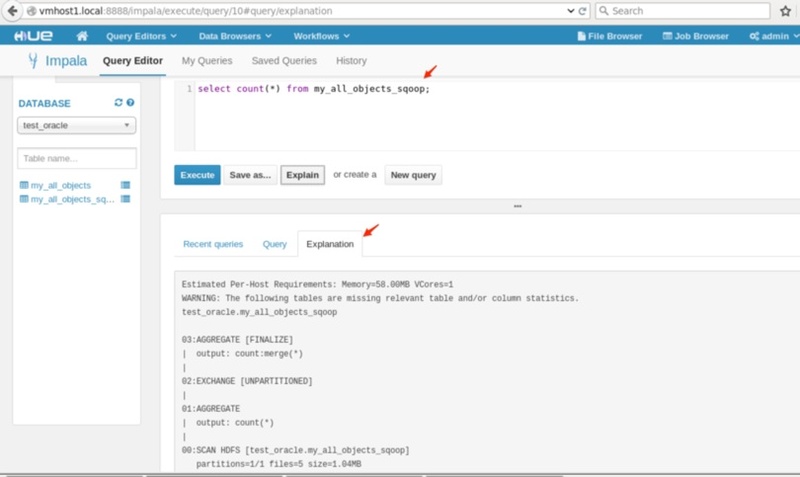 Verify the result on Exadata. The row count and everything looks good. 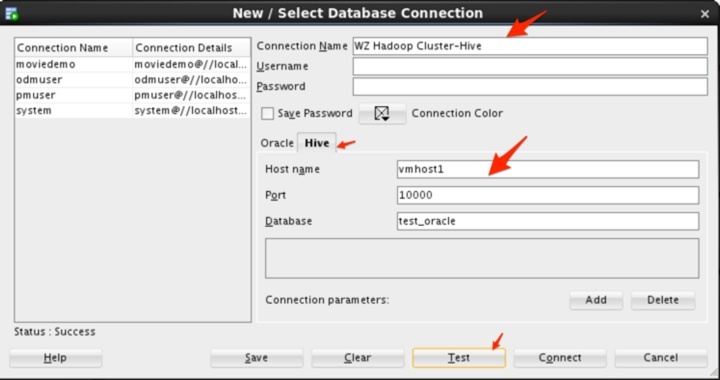 In the next post, I am going to discuss how to use Impala to access the same Hive data and performance comparison between Hive and Impala.